In the previous part of this article, I talked about how you can plan a trip to Chopta and what would be the best time to do so. Continuing in the same serious, in this particular post, I will provide a list of all tourist attractions in Chopta; places that you simply cannot miss to visit while you were there. How many of these places can you cover will entirely depend on the number of days you have in hand; but a total of 3 days is what I reckon should suffice to cover the majority, if not all, of these places. Chopta is famous among tourists as a quiet little hill station, ideal for spending some time in complete silence and peace. It is perfect for visiting with your friends and family; away from the rushed lives that we city folks live. Out here, in the lap of Mother Nature, everything is hushed and beautiful. It is a place where time feels standing still. But this peace and natural beauty are not all that Chopta has to offer. It is also known as an ideal destination for activities bird-watching, trekking, and camping. For a brief introduction, Chopta is a small region of meadows and evergreen forest area in Uttarakhand. It serves as a base for trekking to Tungnath temple and Chandrashila peak. Located at a height of 2,680 meters and surrounded by forests of pine, Deodar, and rhododendron; it is a popular tourist destination that is not yet spoiled by tourist mania. Several rare species of birds and musk deer are found here. Below is a list of places that can be considered as the prime attraction of a visit to Chopta and the area nearby. Some of these are located quite close to Chopta and for others; you will have to either drive or trek for some distance. The thing with Chopta is that there is really nothing “in Chopta”. All of the above mentioned places a few kilometers away and Chopta serves as the base for sightseeing. How many of these places you can cover entirely depends on how long your trip is going to last. But towards the end of the article, I will mention which of places in this list can be considered as “must visit”. Tungnath Temple is the highest of the five shrines of Lord Shiva, also known as ‘Panch Kedar’. It is located at an elevation of 3,860 meters and is believed to be over a thousand years old. As per the mythology, Ravana performed penance at this temple in order to please Lord Shiva. The only way to get to the temple is a 3.5 kilometers long trek that starts from Chopta itself. There is, however, a well laid out path that you can follow all the way to the temple. The trek does get a bit steep at a few points but is not hard at all. This is also a bit ironic considering the fact that Tungnath is highest of all Panch Kedar temples and easiest to reach. The temple remains closed from November to March but the trek remains open in winter as well. Trekking in snow can be a bit dangerous though and it is highly recommended that you do not go without a local guide which you can find at Ukhimath or Chopta itself. Accommodation is available at the temple during the months when it is open; so if you wanted to, you can stay there for the night and return the next morning. Deoria Tal is probably the biggest attraction of a trip to Chopta. It is located near Sari Village at an altitude of 2,438 meters. With its pristine waters and captivating surroundings, this lake is a sight to behold. Spend a night here and the sunrise view is one that you will remember for life. 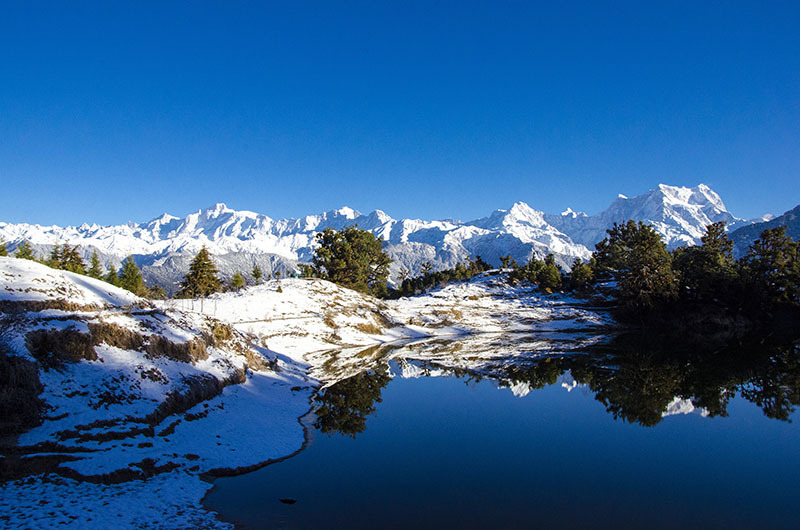 The reflections of Chaukhamba peaks on the crystal clear water of Deoria Tal look magical. Getting to Deoria Tal too involves a little bit of trekking. You can drive up to Sari Village and then will have to trek 3 kilometers to the lake. However, this trek too, like Tungnath Temple, is not a difficult one and can easily be done even by an absolute beginner. Deoria Tal is also quite a popular camping site. An ideal way to do this trip is to trek to the lake, camp there for the night and return the next day. Omkar Ratneshwar Mahadev or simply known as Devariya Nag temple is a temple dedicated to Nag Devta. This small temple is located about half a kilometer uphill as you start climbing towards Deoria Tal from Sari Village. If you went on the Chopta – Tungnath trek and did not mind walking a little more, then you can, in fact, continue trekking all the way up to Chandrashila peak. It is the highest point of the mountain on which Chopta and Tungnath Mandir are located. The Tungnath temple is at a height of 3,680 meters but the trail actually goes further up to Chandrashila at an altitude of 4,130 meters. Like Tungnath and Deoria Tal, this trek as well is not too challenging. It is located at a distance of 1.5 kilometers from Tungnath; which will make the trek a total of 5 kilometers from Chopta. If you are up for more trekking, have some time in hand and are carrying proper gear to camp, then Bisurital is a perfect trek to venture upon. It is the same trek that goes from Chopta to Chandrashila for 6 kilometers that then takes you to Bisurital. Do note though that the lake is about 25 kilometers from Chandrashila and 30 kilometers from Chopta; so you will need at least 3 to 4 days to cover it. Spread over an area of 5 square kilometers, this sanctuary houses and breeds the famous musk deer. It is located at a distance of 7 kilometers from Chopta on Chopta-Gopeshwar Road and can be visited all year long. It is an ideal place for people who either have an interest in wildlife or photography. The dense forest of the sanctuary along with its wildlife presents ample opportunities for photographers to get some stunning pictures. The small town of Ukhimath is actually the winter seat of Lord Kedarnath; who is shifted here each year after it starts to snow at Kedarnath temple. Older shrines of Shiv-Parvati and the protagonists of the tale of Banasura, Usha, and Aniruddh are also located here. The name Dugalbitta literally translates to ‘a space or location between two mountains’. And that is exactly what Dugalbitta is. 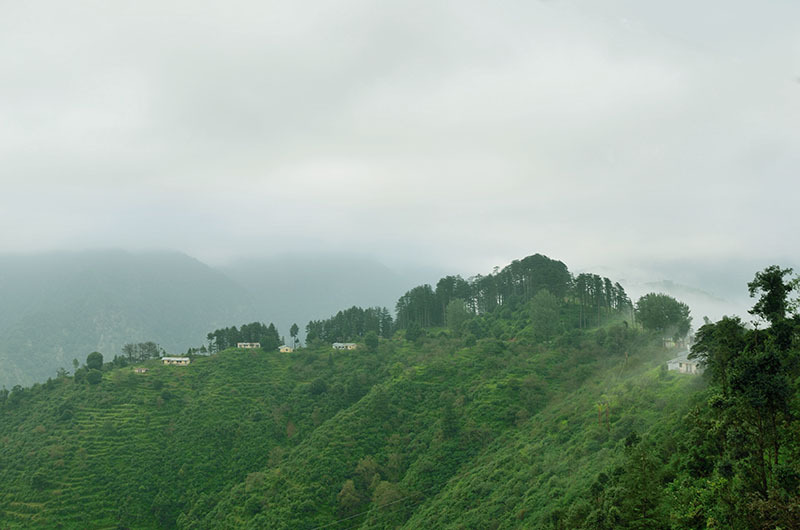 It lies about 7 kilometers before Chotpa as you start driving up from Ukhimath. Earlier, it was merely a stopover for travelers coming to Chopta but now have turned into a getaway in itself. Sometimes, when snow blocks the road to Chopta, tourists travel up to as far as Dugalbitta and return from there. It is a small village located about 4 kilometers before Chopta. The meadow line for Chopta actually starts at this village. There are a few hotels and guest houses here to stay at. A lot of people actually stay at Baniyakund for the night and start their trek to Chandrashila from here via Chopta. Now since we talked about Tungnath, let me also cover other four of the Panch Kedar temples that are located located near Chopta. Madhyamaheshwar Temple is located in the village of Mansuna. In this temple, the stomach of Lord Shiva is worshipped. Together, temples of Kedarnath, Tungnath, Rudranath, Madhyamaheshwar, and Kalpeshwar are the Panch Kedars. As the legend goes, after the epic battle of Mahabharata, Pandavas came here to seek forgiveness of Lord Shiva for killing their relatives in the battle. Lord Shiva, still angry, transformed himself into a bull ‘Nandi’ and hid from the Pandavas. Later, the body parts of Lord Shiva reappeared at five different places. The place where the stomach of Lord Shiva was believed to have been discovered is where Madhyamaheshwar Temple is built. Kalpeshwar Mandir too is a part of ‘Panch Kedar’ temples. It is located at a height of 2134 meters and ‘Jata’ or matted hair of Lord Shiva is worshipped here. This is the only one of Panch Kedar temples that can be visited all year long. Rudranath Mandir is another one of the Panch Kedars temples and Lord Shiva is worshipped as Neelkanth in this temple. There are numerous kunds around this temple, namely the Tarakund and the Suryakund. ‘Vaitrani River’, also known as the ‘water of salvation’ flows right behind it. Kedarnath is situated near the Mandakini River and is probably the most prominent of the Panch Kedars. It is believed to have been built by Adi Shankaracharya and consists of over 200 idols of Lord Shiva. The temple has a Shivalinga which is considered as one of the 12 Jyotirlingas. The structure of the temple is in the pyramidal form. There is a motorable road till Gauri Kund after which one is required to trek for a total of 14 kilometers to get to Kedarnath. If you aren’t too fond of walking that much then Ponies are easily available at the start of the trek. A stay of 2 to 3 days in and around Chopta is what I will recommend to properly explore the place. If you have more time than it is even better but a minimum of 2 to 3 days will be needed for sightseeing. You can spend a couple of nights in Chopta and one at Deoria Tal, which is what most people do. If you were short on time and only want to cover a few of the places listed above, then Deoria Tal and Tungnath Temple are the two places that must be covered. These both can be covered in 2 days easily. If you do not mind a bit of trekking more then hike all the way up to Chandrashila peak. Together, Deoria Tal, Tungnath Temple and Chandrashila peak are what is considered as “must visit places in Chopta”. What to do in Chopta? Chopta is just a small establishment in the middle of nowhere and there is not much to do here; except for visiting all the above-mentioned places. Trekking and camping is one activity that people come here for. Treks that I mentioned above are perfect for a beginner and offer a lot of fun. Wildlife enthusiasts would love to plan a trip to the Kanchula Korak Musk Deer Sanctuary. Photographers will find to keep their hands off the camera throughout the duration of the trip. But most of all, doing absolutely nothing is the best thing to do in Chopta. Spend a few days relaxing, away from the rushed city lives. Enjoy the serene natural beauty around you in complete silence and peace. And that pretty much is all that there is to the topic of things to see in Chopta or things to do in Chopta. I hope the information above was of help. If you need any further details; please feel free to ask in the comments section below; or at our Community Forum; and I will be glad to answer.